Christmas Party Shopping Challenge with boon. It’s safe to say that technology is taking over and the way in which we pay for things is also changing, and in quite a vast way. I feel so out of sync with everyone as i’m still a chip and pin kind of person, and i’m very wary of changing over to contactless or Apple Pay purely for the security factor but when I was contacted by boon., challenging me to basically go shopping for all things Christmas party related and I of course was going to say yes! Prior to this post, if you asked me anything to do with contactless or Apple Pay then I would of looked at you with a blank face but after familiarising myself with boon., and the way it works I can now say that I am definitely on the contactless/Apple Pay hype. boon. is essentially a payment app that you can top up like a gift card in order to make payments around the world in any shop or online app/store that accepts contactless or Apple Pay. Using the boon. app, which is free but only available for iPhone’s you simply create an account, top up your credit, add boon. to your Apple wallet, and you’re good to go! boon. challenged me to essentially go shopping for all things Christmas related, with £100 on my boon. app and a shopping list at the ready I hit the shops. As I was in Plymouth this weekend just gone I decided to visit Plymouth’s Drake Circus shopping centre as I knew they’d have an wide range of shops to choose from. 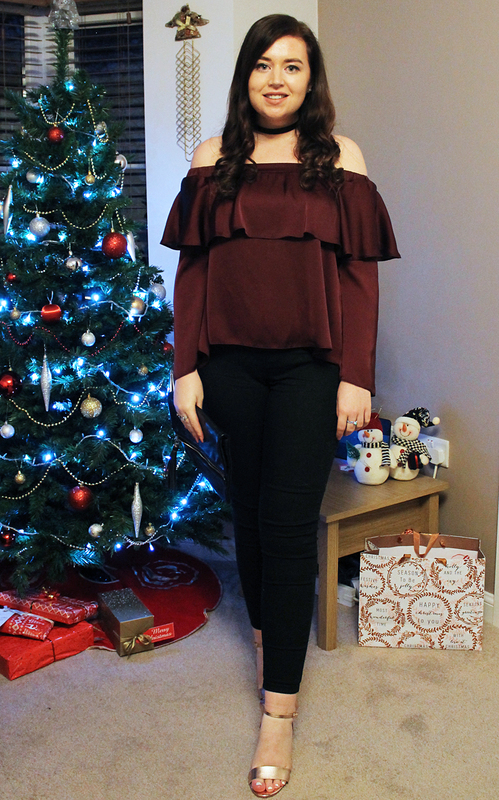 The first thing on my shopping list was the main focal point of this post and this is of course my Christmas party outfit that could be styled a couple of different ways. I decided to head straight to New Look when shopping for my outfit as they had 50% off all of their party wear, and I got some right bargains! I firstly spotted this beautiful Burgundy Sateen Layered Bardot Top* (£11.49), which I just fell in love with and the colour just screamed Christmas to me! When decided how to style this I knew i’d definitely be keeping is somewhat casual, and i’ve never tried New Look’s jean range but I picked up a pair of their Black Skinny Jeans* (£12.99) and I was shocked at how cheap they are! Unfortunately they didn’t have my usual size but I opted for the size up and I actually find the loser fit to be a lot more comfortable and the overall quality is great. I then thought i’d have a browse for a couple of accessories and I spotted these beautiful Gold Strap Heels* (£25.99), which would be perfect for any Christmas party! I love the colour of them and the heel on them is actually so comfortable to walk in that I think I will be getting a lot of wear out of them! Finally whilst queing I found myself looking at the necklaces and being a total non trend conformer that I am, I decided to pick up a Black Ribbon Choker* (£1.49) as I thought it would work really well with this top, and overall I really like this outfit! 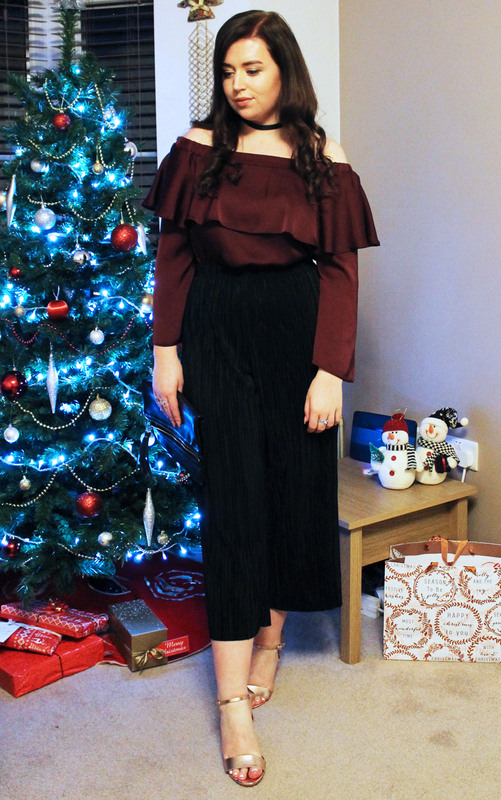 With the top being the main piece of my Christmas party outfit I also decided to show you another way in which i’d style it, and my go to trousers on a night out at the moment are my Topshop Black Pleat Trousers (£32.99) which I just love! They work with absolutely everything and are so effortless but they still look really classy when dressed up! Finally to finish off both of these looks I opted for my trusty H&M Zip Clutch (£12.99), as I thought it tied in with both the heels, and the choice of black trousers. Secondly on my shopping list was a Christmas party accessory and with my Christmas party being a masquerade theme this year I thought finding a mask would make a great accessory! Whilst browsing H&M I spotted that they had a really good selection of masks, and I opted for their Gold Sequin Mask* (£7.99) which they don’t have online but I just fell in love. I thought it matched well with the heels and the added pink ribbon just looks so cute! Next on my shopping list was a Christmas jumper, and it wouldn’t of been a Christmas shopping challenge without one! 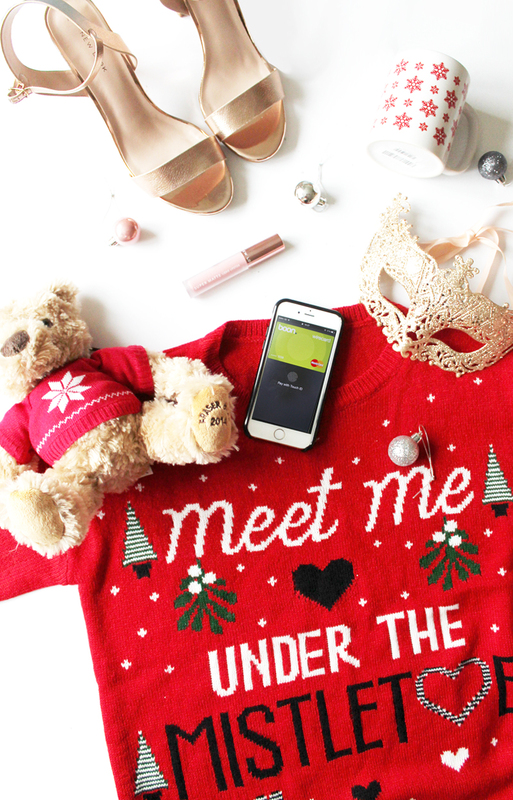 Whilst having a little browse around Newlook I came across their Christmas jumper section and instantly fell in love with their ‘Meet Me Under The Mistletoe’ Jumper* (£14.99). Being the lonely singleton that I am, I thought this was very fitting and a little more quirky in comparison to my other Christmas jumpers and I will no doubt be rocking this on Christmas day. Finally the last thing on my list was a secret santa gift, but this gift in particular had to be purchased in a charity shop in order to not only raise awareness for charity at this time of year, but to also show that boon. can also be used in charity shops which is great as you can find some great bargains! I found myself browsing around St Lukes Hospice Plymouth who care for those with serious illness’s including cancer and lung disease to name a few, and their charity shop had such a huge selection of cute second hand gifts. Whilst browsing I found this cute Christmas Teddy* (£1.50), which I thought was very fitting for a secret santa gift and then to go with the pattern of his jumper I also picked up a cute Snowflake Mug* (£1), which I thought made such a cute yet Christmasy secret santa gift. In addition to being able to use boon. in charity shops, every month boon. celebrate #boonforcharity with a contest which is ran once a month where the winner with the best charity shop purchase can win £100 boon. credit for themselves and £100 for the charity of which you purchased from by simply #boonforcharity on social! To find out more on how to enter, then find out more info here and good luck to anyone who enters! All in all I really enjoyed my shopping experience with boon., as it made paying for things super easy as I wasn’t faffing with getting my purse out of my bag, but I also found the paying experience still secure as you have to scan your finger print that is registered to your iPhone in order to allow any payment to go through, which is big relief if you unfortunately misplace your phone! As Apple Pay and contactless is widely accepted in most major retailers I didn’t really have problems when shopping, but I did make sure they all the shops I went into accepted Apple Pay before browsing around. The only major disappointment was Topshop, who didn’t have either Apple Pay or contactless, sort it out Topshop! Finally boon. are currently holding a Secret Santa Facebook Contest, where they are running a daily contest in the run up to Christmas where 15 daily winners can win £10 of boon. credit! All you have to do is download the boon app from the app store, and enter through their Facebook page here. So goodluck to anyone who enters, and enjoy spending your boon credit if you win! Have you shopped using boon. before? *This post was in collaboration with boon., who credited me £100 boon. credit in order to complete my shopping challenge.